I'm a beginning trad leader, having done about five easy fifth class leads. I've had some formal instruction, but don't currently have access to a teacher or mentor. I'm finding that I'm extremely slow as a leader, even when the climbing is easy, and I'm wondering whether this is can be improved by doing something about the way I rack my gear or the the steps I go through with my free hand. I would like to get more efficient so I can be more solid on more difficult climbs, complete more climbs in a day, and maybe start getting ready to do some multipitch. Let's say I'm going to place a cam in a vertical crack, and I have a solid stance that gives me one free hand. I have a bunch of alpine draws on my left gear loop, and cams on my right, each with a carabiner. Since the draw has two biners and the cam has one, that's a total of three, which is one more than I need. I would probably place the cam with my right hand, then reach over with the same hand to grab a draw to use as an extension in order to reduce rope drag. I clip the draw into the cam's loop of webbing, and then I may need to manipulate the biner on its free end in order to increase the length of the draw (awkward with one hand). Then I probably need to pull up some rope, and I may not be able to do this without letting go of the draw -- ugh, now the draw may have dropped down into the crack where it's hard to get at the biner. I take the rope in my teeth, reach into the crack and pull the biner back out, and clip in. Now I've got pro at this anchor. I still have the extra biner stuck in the cam's loop of webbing, so I take that off and put it on a gear loop. What could I improve about my procedure? Are there youtube videos showing experienced climbers doing this sort of thing efficiently? [EDIT] I spent some time on youtube, found these three videos that might be relevant: A, B, C.
In A, at 0:22, he uses a cam without any extension. He pulls it off his rack, bites it in his teeth, and then turns it around to place it. At 1:11 you can see that some cams are on a doubled short sling, not just on the little loop of webbing a camalot is normally sold with. It's not an alpine draw; there's only one biner. The slings look shorter than a normal 60 cm sling, maybe only 40 cm? At 1:52, he has a nut that already seems to be on a quickdraw. Was it racked this way, or did he clip the quickdraw on during the climb? In B, at 0:25, he has his cam on its little loop of webbing, which he extends with a quickdraw. Seems pretty efficient. At 1:11, he places a cam, then there's a quick fade and he has a sling with a single biner on it, which he uses for extension. Was there another biner on that sling, which removed during the fade? In C, he advocates a rack with 6 quickdraws and 2 alpine draws. I'd been using nothing but alpine draws. I had an instructor tell me that basically quickdraws were only for sport climbing, not trad, because (1) you need to have more extension available, and (2) the stiff quickdraw can twist your pieces out of their placements as you climb past them. In general it sounds you're not doing anything obviously stupid and you just need more practice. I generally rack some 'draws on both sides - sometimes it can be handy to avoid reaching across. And you can often avoid the 'draw falling into the crack by resting it on a hold, across your wrist or something like that. Try not to place/clip gear far above your head. It feels reassuring but wastes much time and energy, especially with the need to pull up and fiddle with a large amount of slack rope. The obvious exception would be if you're placing gear from a comfortable stance before launching into a crux section in which stopping would be strenuous or precarious. I mostly use longish but non-extendable skinny 'draws for trad - 20 to 30 cm - and only carry a few sling-draws for situations where I think I particularly need a lot of extension. I don't use really stubby sport 'draws, for the same reasons you state from "C"
Like you, if I'm not totally pumped and desperate I'll often "harvest" the original krab from the cam in case it might be useful for something later such as building my anchor. Not really necessary/important though. he has a nut that already seems to be on a quickdraw. People sometimes do this if they are on a route where they know there is a particular desperate/crucial placement. Unusual special situation. some cams are on a doubled short sling, not just on the little loop of webbing a camalot is normally sold with. DMM makes cams with extendable slings that can sometimes save a quickdraw. I personally find them fiddly, especially to re-rack when seconding. You extend placements with trad draws when the line you are climbing wanders, in order to minimize rope drag. You do not always need to extend them. 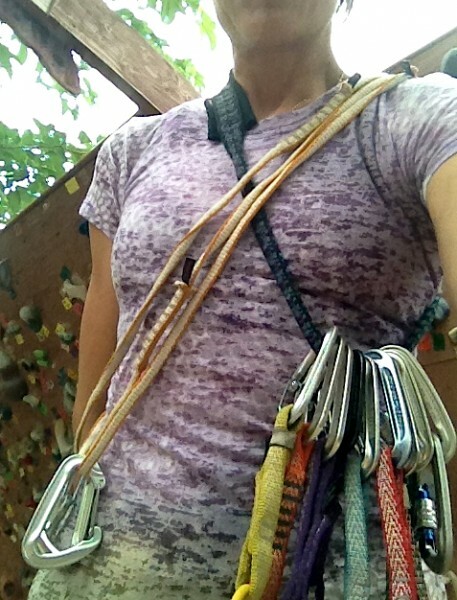 I climb with a mix of short sport-type draws and extendable trad draws for that reason. Sometimes you can even just clip the racking biner that the cam was hanging on already (obviously for nuts or anything not already racked on a biner, you need a draw). Sometimes you may also need to extend a placement in order to isolate the placement from rope movement (to prevent a cam from walking or a nut from rattling around in a loose placement). But don't extend pieces unnecessarily, because that wastes time. In general: practice. A lot. And if you want to be fast, practice being fast (stay safe of course). Also, get good at clipping the rope into a draw lightning fast. Practice this on the ground, with both hands, with the gate facing both left and right (there are 4 combinations of R/L hand and gate facing R/L - practice them all). Do this until it is instinctive, smooth and crazy fast. Make a game out of seeing how many clips you can get in 1 minute. Good sport climbers are often very good at this, get one to teach you (or watch youtube). And lastly: practice. A lot. I've recently stopped doing this. I now mix my gear and draws up, so both sides has some gear and some quick draws. This allows me to access a piece of gear and a draw with a single hand, no need to change hands on the hold or do the awkward trying to reach the right side with my left hand manoeuvre. I think a big part of speeding up is scouting the route from the ground (or knowing the area) and modifying your gear to the area in question. If you are climbing at Indian Creek, you need a lot of one size cam, with a biner on the end. You place, clip, and go. There are probably so many you are going to rack on both sides. You never need to extend anything. I grew up climbing in the Gunks where all the routes wander and go over these little roofs that cause rope drag from hell. Where you are a Gunks climber, the first thing you do when you get a new cam is cut off the sling and replace it with an extendable 1/2 shoulder length sling. That way you can rack with a regular cam length sling but rapidly extend it to a quick draw length sling and only have to worry about a single biner. I also keep a bunch of shoulder length runners with a single biner like Steph Davis. If the route looks really crazy you might even need to extend a piece with a double shoulder length sling. There is no really good way to deal with that, but different color clings and having them go the other way helps. Places like J-Tree are a real challenge because sometimes the cracks are splitter like Bird of Fire and sometimes they slant or wander all over the place like Illusion Dweller. Since most of the routes are short, you can sometimes plan ahead. Not the answer you're looking for? Browse other questions tagged rock-climbing ropes trad-climbing or ask your own question.